Community health workers such as Rosaura Polanco, center, are a bridge between the communities they serve and formal health systems around the world. Photo by Jessica Turner for IntraHealth International. 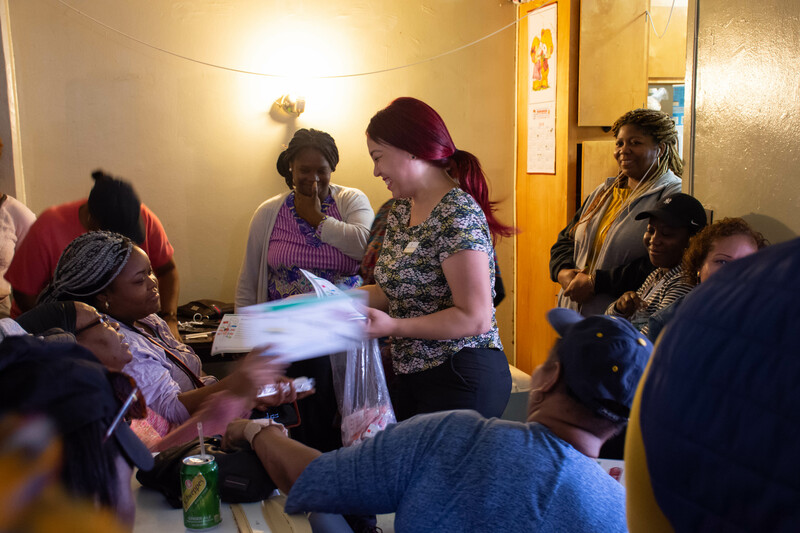 Last week I shadowed Rosaura Polanco, a community health worker in the South Bronx in New York City, where she provides underserved women with health education and essential health services. Having only seen examples of community health workers operating in sub-Saharan Africa, I asked Rosaura what unites them around the world, despite their differing roles and contexts. “Empathy,” she replied. “I practice empathy, for everything, all the time.”Rosaura works for Grameen PrimaCare, a sister organization to Grameen America that provides women from low-income immigrant communities with high-quality, affordable primary care. By providing health education to women enrolled in the Grameen loan program, which provides group-based microfinancing for small business, Rosaura reaches a population that often remains hidden, excluded from formal institutions such as health facilities. Rosaura arrives at a women's loan session in the South Bronx, to deliver health education on sugar consumption. Photo by Jessica Turner for IntraHealth International. Each week the participants meet in one of their homes to repay their loan installments. Rosaura waits and then delivers short health education sessions. Photo by Jessica Turner for IntraHealth International. Rosaura is always on call. Participants in the loan program have her phone number and know they can call her for anything. Photo by Jessica Turner for IntraHealth International. Vicky (right) works in community outreach for a local hospital. She works closely with Rosaura to arrange appointments and serves as a friendly face and support system within the hospital. Photo by Jessica Turner for IntraHealth International. As a community health worker, Rosaura spends a lot of time on the subway going to meetings, to the office to prepare educational hand-outs, and to the local hospital. Photo by Jessica Turner for IntraHealth International. Rosaura is an advocate for greater strategic investment in frontline health workers. Here she speaks at the 2018 UN General Assembly with Vince Blaser of the Frontline Health Worker Coalition (left). Photo by Jessica Turner for IntraHealth International. Her morning begins with attending a loan group meeting of around 40, mostly Latina, women. She sits patiently as participants deliver their repayments and discuss their business plans. These meetings can get highly charged: if someone doesn’t repay on time, the rest of the group shares the burden. Then Rosaura stands up and shares information about the dangers of high levels of sugar in the diet. Over the course of the women’s loan repayment process, Rosaura will work through a carefully selected curriculum of topics, including diabetes, nutrition, cancer, and vision. She provides them with useful handouts and tips for staying healthy, along with advice for when and how to seek medical attention. She knows the community she serves because she’s part of it. Rosaura works closely with community engagement teams at the local hospital, easing the women through the challenging process of obtaining health services when their English may be limited, legal status undefined, and insurance nonexistent. “If I see someone is very scared, I say to them, ‘You remember Vicky in the hospital, right? Talk to Vicky, she’s going to help you there,” Rosaura says. Crucial to Rosaura’s role is the trust she has generated with the women in her community. Like many community health workers, she knows the community she serves because she’s part of it. This trust is evident in the way the women look at Rosaura, speak to her, and embrace her throughout the session. Even their willingness to accept me, an outsider, into their intimate meeting, is evidence of the bond she has generated with this group. This trust has grown not just through the education sessions, but through the appointments at the local hospital Rosaura books for clients, and even attends with them, when necessary—such as when a woman is nervous or needs a translator. Through the experts in immigration law and domestic violence that she brings into their homes. And through the late-night phone calls when one of her clients needs support. The WHO's first-ever community health worker guidelines will be unveiled this month. As a community health worker, Rosaura guides these women through a challenging health system, at some of the most vulnerable points in their lives. The versatility of the community health approach enables health workers like her to respond to the unique set of challenges faced by the groups they serve. As I stood in the crowded room, thankful to Rosaura for this rare opportunity, her intimate understanding and empathy were palpable. Rosaura plays an integral role in the lives of the women she serves, and she’s not alone. Community health workers all around the world are dedicating themselves to ensuring the hardest-to-reach groups can access the health services they need, from rural communities in Rwanda to nearly 70% of the population in Brazil. They’re even being considered as a widescale solution to the problems of the National Health Service in the UK. And as momentum grows around community health worker programs worldwide, advocates eagerly await the unveiling of the World Health Organization’s first-ever community health worker guidelines this month at the Primary Health Care Conference in Astana, Kazakhstan. Follow IntraHealth International and the Frontline Health Workers Coalition, who will be tweeting from the Astana conference with updates on these crucial guidelines. Rosaura received storytelling training from IntraHealth International and the Frontline Health Workers Coalition with funding from Medtronic Foundation last year and has since spoken to hundreds of policy-makers to raise awareness of the need to increase strategic investment in community health workers.